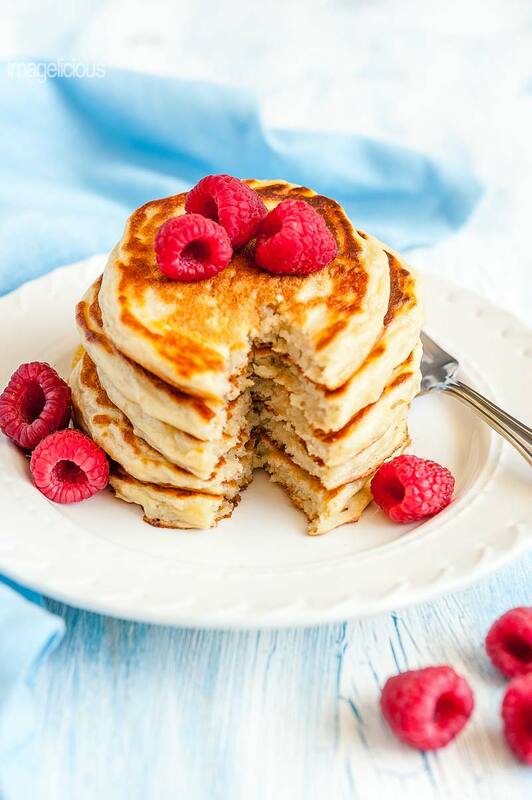 These Greek Yogurt Pancakes are the easiest and fluffiest pancakes you’ll ever have. Made with healthy greek yogurt and oats they’ll become your favourite breakfast. Use the same batter to make waffles for a crispy treat. I’ve posted this recipe originally three and a half years ago and I took these photos almost exactly four years ago to date. And I still make these Greek Yogurt Pancakes all the time. So, today I am resurrecting this recipe as it’s my absolutely favourite way to make pancakes or waffles and I made many pancakes in my life. To be honest, most of the time when I make pancakes, I just mix whatever ingredients I have on hand and hope for the best. Sometimes it’s yogurt, sometimes sour cream, sometimes milk or kefir or ricotta. Then I add eggs and flour to get it to proper consistency. Sometimes those recipes work, sometimes not. One time I was experimenting with another batch of pancakes and the result was amazing. 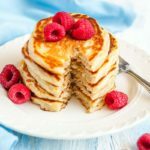 It was so good, that the next time I actually measured the ingredients and then again and again, until I got this perfect recipe for Greek Yogurt Pancakes that I use all the time now. A few years ago I shared this recipe with a co-worker and after reading the ingredients, she immediately said that she didn’t like oats. Well, here’s the thing. You will not taste oats in these Greek Yogurt Pancakes. 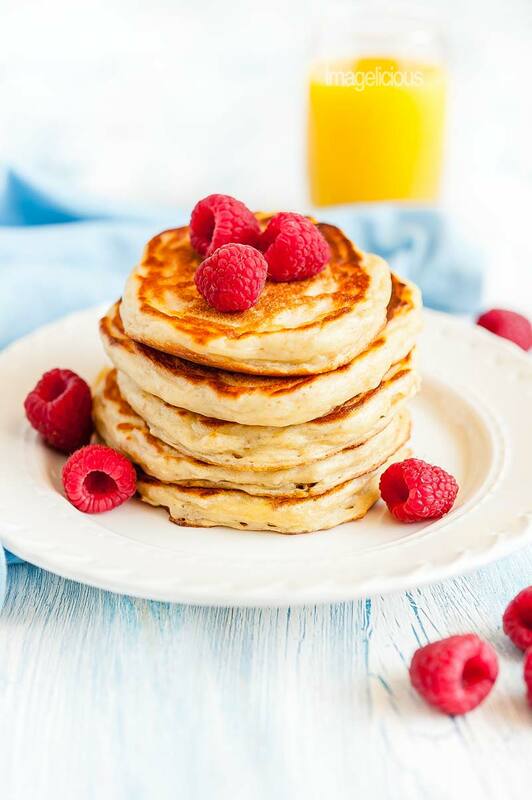 Oats add fibre, nutrients, and bulk to the batter, making the pancakes a bit healthier. Using quick oats means that they will melt into the pancake batter and will not change the texture or add any unusual flavour. If you don’t have quick oats, you can omit them. I would not add more than the specified amount though. I tried and more than 1/2 cup made the batter heavy and the resulting pancakes less fluffy. Technically, if you look at most waffle recipes, you’ll see that they use a lot of melted butter, sometimes up to one whole stick of butter! This much butter makes the waffles super fluffy and soft. I am all for a delicious soft waffle but having 1/2 cup of butter in my breakfast doesn’t sound like a healthy choice. So, I just use my pancakes batter to make waffles with no changes. And believe me, the Greek Yogurt Waffles will be delicious! Start by mixing yogurt and soda in a medium bowl and let it foam a little bit. Add eggs and milk to the soda-yogurt mixture and mix well. Make sure to NOT overmix. Keep the batter lumpy! If you overmix, then the resulting pancakes will be glutenous and rubbery. You may need to add more milk if the batter is too thick. Add a table spoon of oil to the batter and lightly mix. Heat the pan on medium. Lightly brush oil on to the pan and pour heaping spoons of batter. Cook on medium until the bubbles start to appear on the pancakes, about 2-3 minutes. Then flip them and cook another 2-3 minutes or until the pancakes are cooked through. Times may vary based on your stove. I sometimes lower the heat and cook them longer. I keep my pancakes in the warm oven while I cook all the batches. I use the same recipe for waffles too. I know, I know, all the cookbooks that I have say that waffles require about 6-8 tablespoons of melted butter, but I just can't fathom adding so much fat into my breakfast. And I can assure you that waffles that I get with only one tablespoon of oil are still very delicious. When I make waffles, I don't worry about them being fluffy since I actually go more for crisp, so I add more dry ingredients - either oats or wheat bran, about 1/4 cup. I figure that it's healthy and if it doesn't effect the taste, then why not. When I see those picture’s above I fell so hunger and I can’t explain what kind of Hungry it is and I want to know how to make like a desert like that,..Do you have an tutorial video? ?